The melting of the polar ice cap could bring significant savings for international shipping firms — which might result in better prices for consumers. A new route recently appeared on international commercial shipping maps. Known as the Northern Sea Route (NSR), it stretches for 3,500 miles, taking ships through the Kara Strait off Russia’s northeastern coast to Canada’s Providence Bay. Although the route has been known for some time, during the Soviet era it was closed to foreigners. And even despite climate changes, it remains ice-bound for part of the year. An ice lane for super-heavy vessels was opened only in 2010. This route is a third shorter than the traditional route from Asia to Europe via the Suez Canal. It reduces the transit time on the benchmark Rotterdam-Yokohama route from 35–38 days to 20–23. Recently, Mikhailichenko’s organization measured the speed of passage through the NSR of 15 super-heavy vessels: The vessels took 7-22 days, depending on the weather conditions and the exact route. Daily maintenance outlays per tanker come to $40,000-50,000, so choosing the NSR over other options could result in significant savings. The route could be used for the trans­portation of container goods, coal, and metal, according to Andrei Shenko, an analyst at Investkafe. 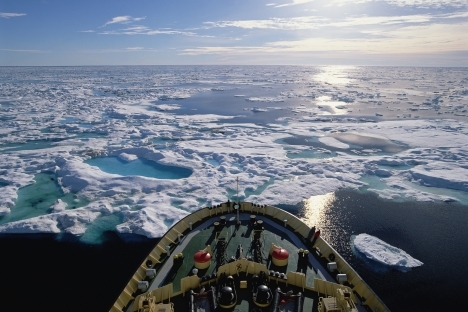 To increase the route’s commercial appeal, a permanent fleet of icebreakers needs to be established to keep the route open year round. By 2020, Russia plans to build three shallow-draft diesel icebreakers at a cost of 25 billion rubles ($789 million), and a new nuclear icebreaker for 20 billion rubles ($631 million).